A young public servant, Mike Cullen is also a regular contributor to (Cult)ure Magazine as a music editorialist. His passions include music, coffee, writing, travel and, of course, comic books. At the tender age of ten, I discovered comic books, much to my mother’s chagrin. I had always been a fan of superheroes having grown up with the likes of the Superman movies, and the old (and very laughable) 1960s Adam West/Burt Ward Batman series. It was harmless enough, but once the comic book collecting began, my compulsive behavior began. Finding a decent comic book store in Winnipeg during the mid-90s was a difficult task, they were either too far away, or lack of money got in the way. It was not until I moved to Ottawa in 1996 and really not until 2000 that I found the perfect comic book store to get my regular fixes from. I have not been a regular collector in a number of years. I am rapidly running out of space in the house I share with my roommate, and long gone are the days when you could get a single issue off the rack for a buck; they now average about five dollars a pop. Things like rent and food are suddenly more worthy of my money than the latest issue of Superman. I still have an affinity to comic book stores though, and when I am in other cities, I try to find to find a local comic book shop to browse through. 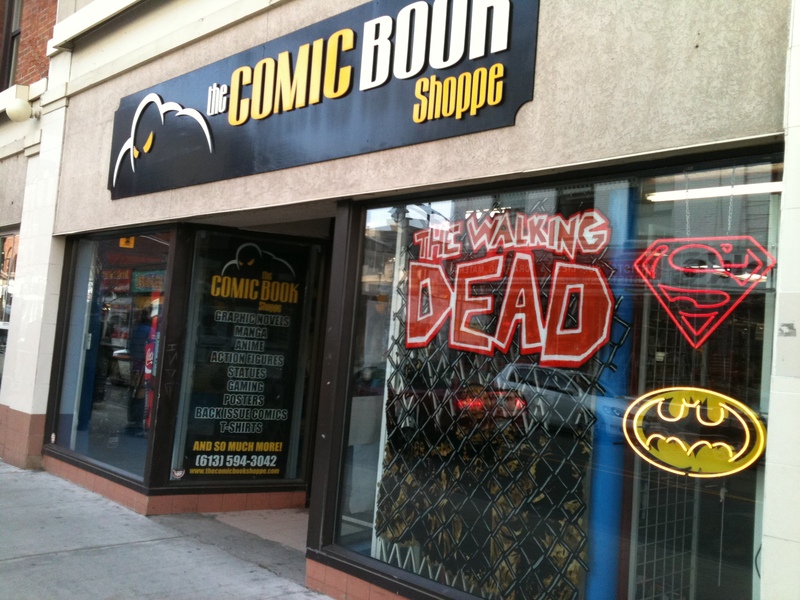 My favorite shop though, remains the one I visit and shop at here in Ottawa: The Comic Book Shoppe located at the corner of Bank and Lisgar Street (a second location can be found in the west end on Clyde Avenue). The Comic Book Shoppe offers your usual assortment of comic books, graphic novels, action figures, anime and DVDs, but what I have always found the most unique aspect of this store is the sense of community and camaraderie that exists between staff and clients. I have been a customer for over ten years, and while I do visit as often as I used to, I am still greeted by name and treated as though I was a member of the family. This coupled along with the expertise and knowledge of the staff (with a wide variety of interests and tastes), makes this one of my very favorite shopping experiences. While perhaps not a tourist hotspot per se, for me and many others living in Ottawa, this store is an important part of our personal geography. The Comic Book Shoppe is definitely worth a stop if you or someone in your companionship is a comic book/cartoon/anime aficionado. I love this store! I got my Xavier’s varsity shirt there.